The one-sentence statement was broadcast throughout Quebec within minutes of its midmorning release last Friday. 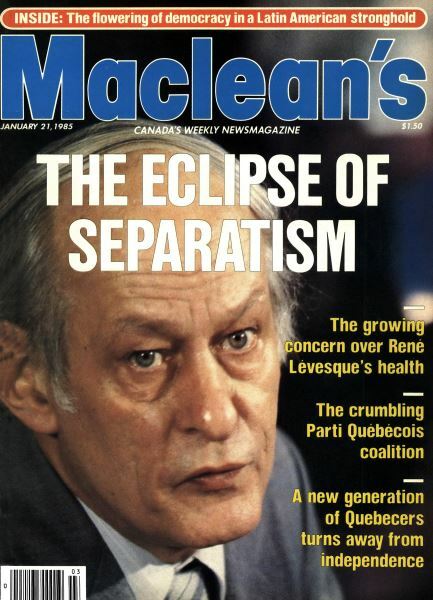 Premier René Lévesque, according to an announcement from his office, had returned “earlier than scheduled” from a Caribbean vacation and was undergoing medical tests at Quebec City’s Enfant-Jésus hospital. 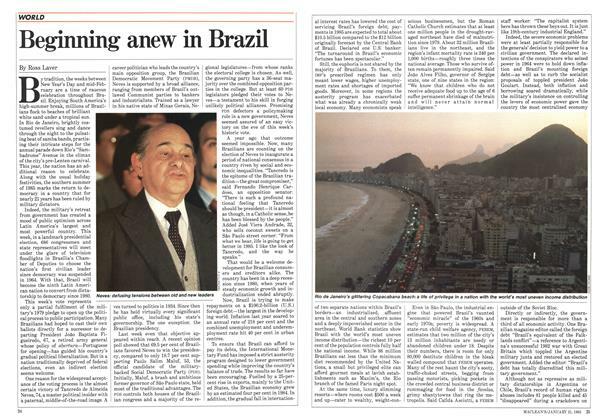 By tradition, the weeks between New Year’s Day and mid-February are a time of raucous celebration throughout Brazil. Enjoying South America’s high-summer break, millions of Brazilians flock to beaches of brilliant white sand under a tropical sun. The mood was cool, sober and intensely businesslike in Geneva. 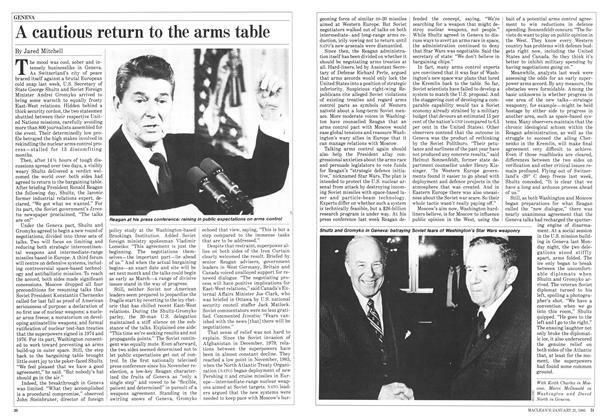 As Switzerland’s city of peace braced itself against a brutal European cold snap last week, U.S. Secretary of State George Shultz and Soviet Foreign Minister Andrei Gromyko arrived to bring some warmth to equally frosty East-West relations. There are many Canadians who would disagree with Barbara Amiel’s views as expressed in her Dec. 24 column, “The blooming of hypocrisy.” Many people in the real world, which she decries, do believe in equal pay for work of equal value, affirmative action and multiculturalism and do not consider it hypocritical to support those views. Branching off Highway 802, about 150 km west of Thunder Bay, Ont., a side road dips and bends and stops at a chain-link fence. Beyond the fence is an abandoned British-American Oil Co. service station. In the distance, two dozen bungalows line gently curving streets. The interest rate squeeze on home buyers and other borrowers moderated slightly last week. Canada’s banks lowered their prime lending rate—offered to their best corporate customers—to 11 per cent from 11.5 per cent. Most of the major banks immediately followed by lowering mortgage rates —most institutions dropped the interest charge for a one-year mortgage to 11 per cent from 11.25 per cent. 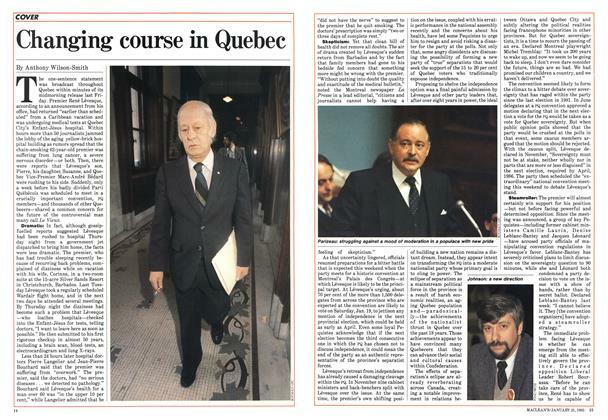 On the morning of May 8 last year, a heavily armed man entered the Quebec national assembly and opened fire. Three people died, and 13 were wounded. Last week Canadian Armed Forces Cpl. Denis Lortie, 25, went on trial in Quebec Superior Court on three murder counts arising from the attack.